Swarovski There are 25 products. 6mm Swarovski Crystal Cube (AB) Sterling Rosary Bracelet Boxed 6 mm Crystal Swarovski Cube Traditional Rosary Bracelet in Fine Sterling Silver. 6mm Swarovski Pink Cube (AB) Sterling Silver Rosary Bracelet - Boxed Traditional Rosary Bracelet in Fine Sterling Silver. 7mm Swarovski Lt Sapphire (AB) Sterling Silver Rosary Bracelet - Boxed Traditional Rosary Bracelet in Fine Sterling Silver. 6mm Swarovski Caribbean Blue Sterling Rosary Bracelet Boxed 6 mm Caribbean Blue Swarovski Traditional Rosary Bracelet in Fine Sterling Silver. 6mm Swarovski Crystallite Sterling Rosary Bracelet Boxed 6 mm Chrysolite Swarovski Traditional Rosary Bracelet in Fine Sterling Silver. 6mm Swarovski Crystal(AB)Sterling Rosary Bracelet Boxed 6 mm Crystal Traditional Rosary Bracelet in Fine Sterling Silver. 6mm Swarovski Light Rose(AB)Sterling Silver Rosary Bracelet - Boxed Traditional Rosary Bracelet in Fine Sterling Silver. 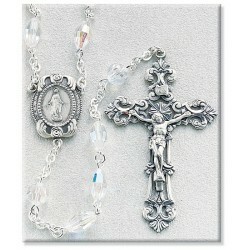 6mm Swarovski Pink (AB) Sterling Silver Rosary Bracelet - Boxed Traditional Rosary Bracelet in Fine Sterling Silver. 6mm Swarovski Erinite (AB) Sterling Rosary Bracelet Boxed 6 mm Erinite Swarovski Traditional Rosary Bracelet in Fine Sterling Silver. 6mm Swarovski Fuchsia (AB) Sterling Silver Rosary Bracelet - Boxed Traditional Rosary Bracelet in Fine Sterling Silver. 6mm Swarovski Opal (AB) Sterling Silver Rosary Bracelet Boxed 6 mm Opal Swarovski Traditional Rosary Bracelet in Fine Sterling Silver. 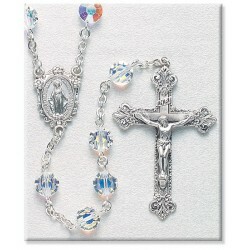 6mm Swarovski Silk (AB) Sterling Silver Rosary Bracelet - Boxed Traditional Rosary Bracelet in Fine Sterling Silver.